Have fun with your pooch! Sue and Millie love Lake Michigan beaches! Advertised Lake Michigan dog beaches are few and far between. 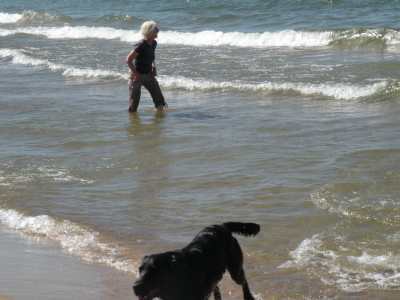 With so many beaches along this coast one would think beaches that allowed dogs would abound but that is not the case. Before Memorial Day or after Labor Day most beach area traffic has thinned out. Often times I have taken Millie to beaches not on the list for a short run and swim. Usually no-one says anything but you still must be mindful of the rules. While I have never been asked to leave, once while leaving a city beach, a city employee reminded me dogs were not allowed. Millie and I go to the beach year round! Please clean-up after your pets. There are groups who would prefer not to have any dog beaches for us too enjoy. Lets not give them fuel for their arguments. The list below is of the known beaches that allow dogs. Even they have restrictions as to where pets are allowed. Please be sure to check when entering the parks. Grand Mere State Park Stevensville, Michigan. Warren Dunes State Park only allowed north of swimming beach. Sawyer, Michigan. Grand Haven City Beach - The City Beach between the swim buoys(Memorial Day to Labor Day), however,dogs are permitted on the City Beach south of the southerly swim buoy.Norman F. Kruse Park Muskegon, Michigan. Zoll Street Beach Harbor Springs, Michiagn. 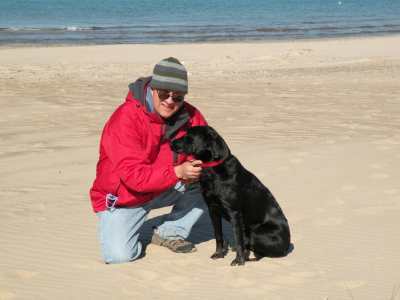 If you know of any other dog beaches along Lake Michigan that we have missed please contact us so we can add them. Dog beaches are just too much fun to keep to ourselves. 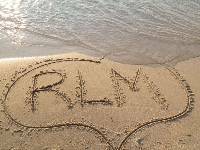 Return to Romantic Lake Michigan Home page.